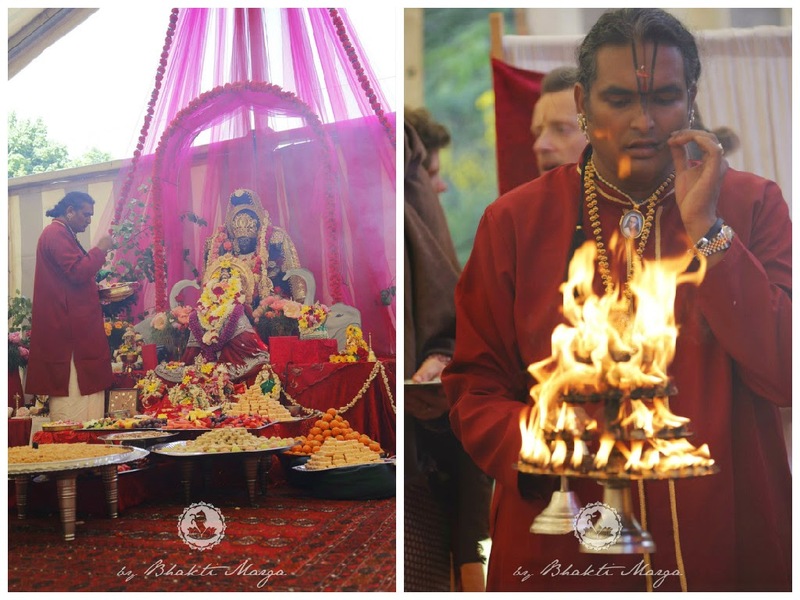 This last weekend more than 300 people gathered at Shree Peetha Nilaya to participate in the Mahalakshmi Yagna with Sri Swami Vishwananda. 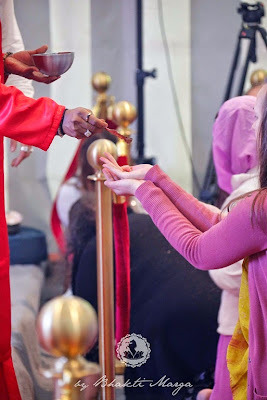 This event was perfectly timed, as Sunday coincided with the international Mother's Day. 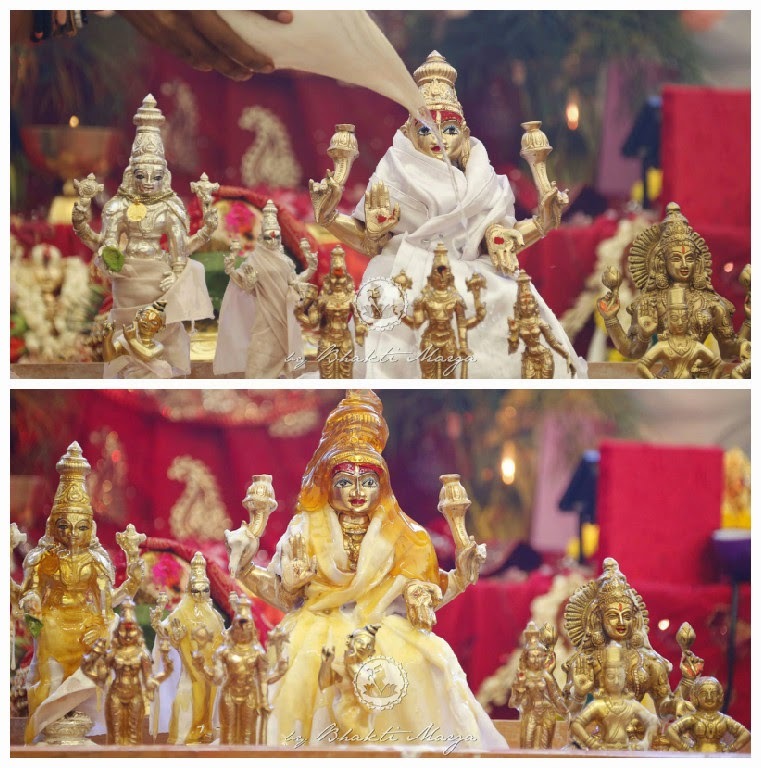 Divine Mother's sweetness was felt throughout the weekend, filling our hearts with love and joy! 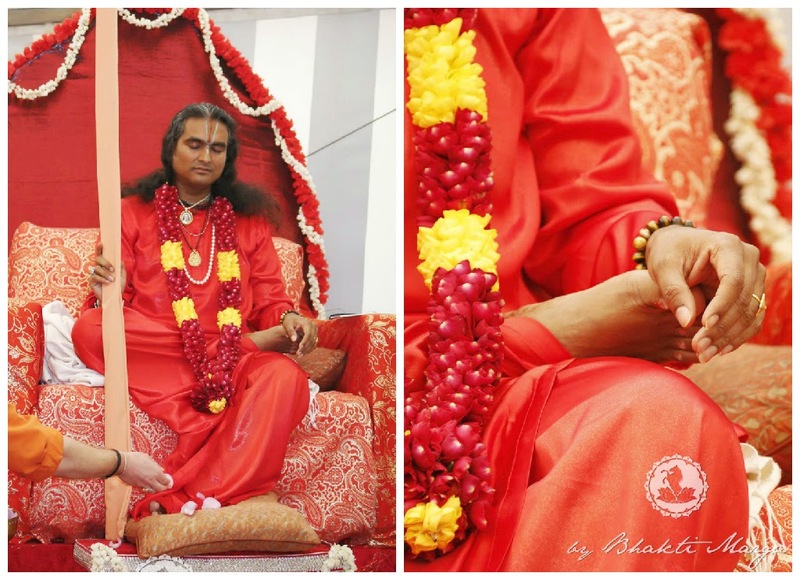 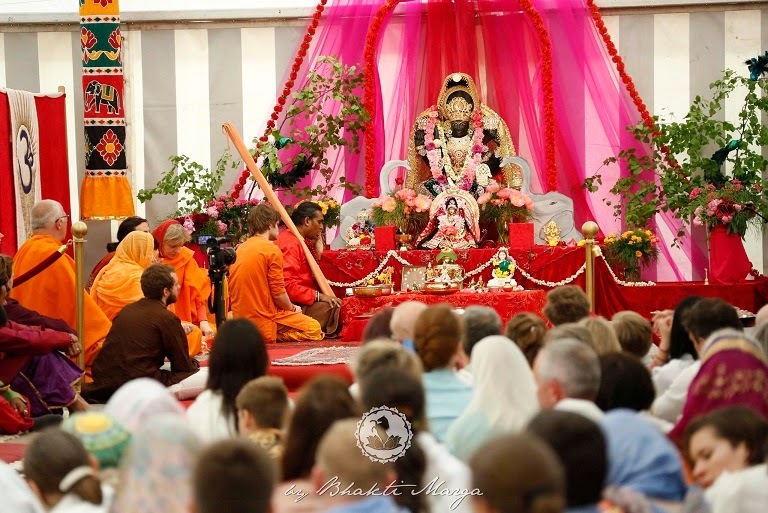 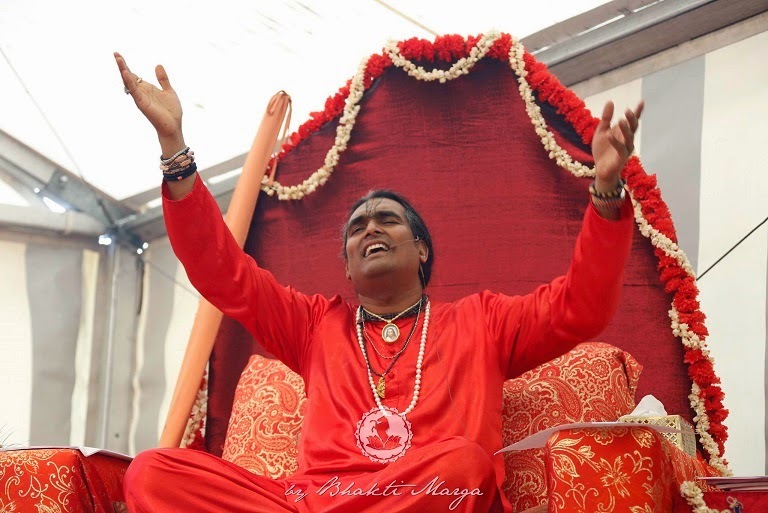 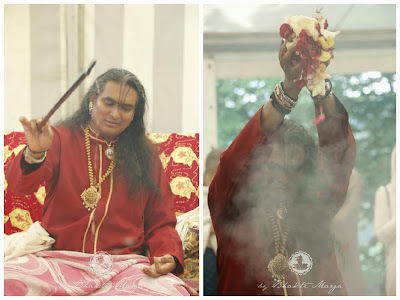 On Saturday morning, Sri Swami Vishwananda opened this event with a very interesting speech about Mahalakshmi. The highlights of this speech will be published in this blog in a next post. 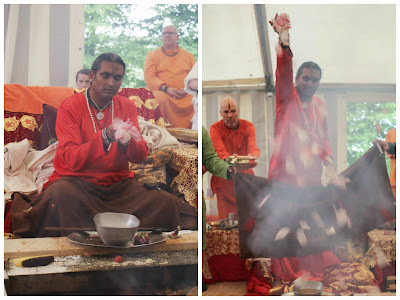 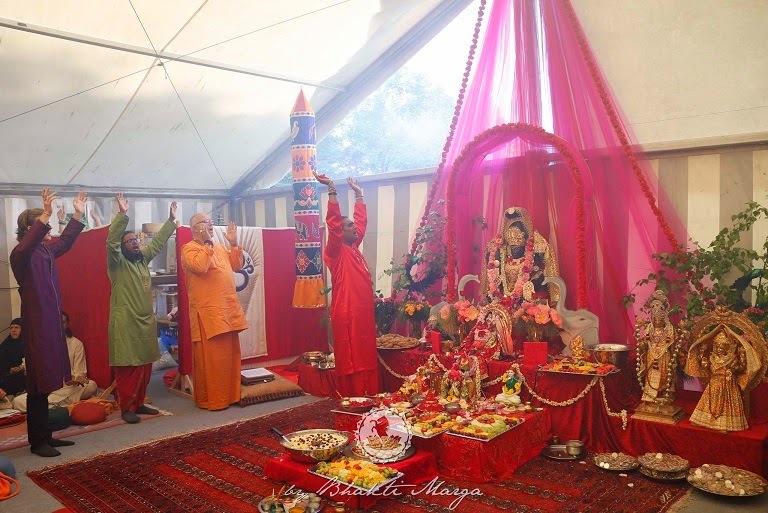 The ceremonies started with Guru puja, followed by Kalash puja and Yagna performed in three kunds simultaneously. 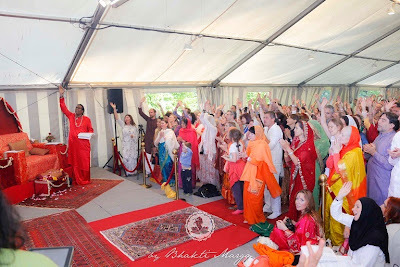 The day ceremonies finished with Mahalakshmi arati but the magnificent kirtan of the day continued led by Sri Swami Vishwananda while people were having Darshan of Mahalakshmi. 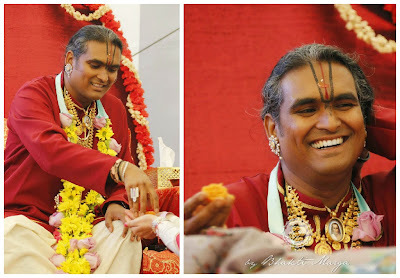 At a certain point, Swamiji took a bowl of water from the altar and started to distributed it to everybody. 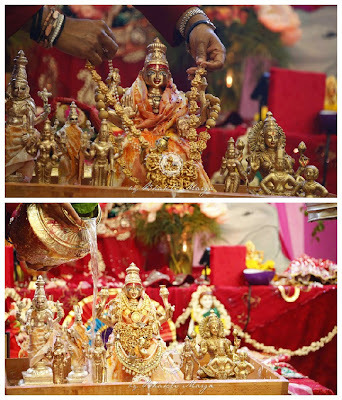 At the end of the ceremonies everybody could partake of the delicious prasad. On Sunday morning, the ceremonies started with Guru Paduka Abishekam, followed by Kalash puja. Afterwards, the fire was lighted in the three kunds and the Yagna started. Sri Swami Vishwananda arrived bringing a Mandir with some of his private murtis and placed them in the abishekam tray. 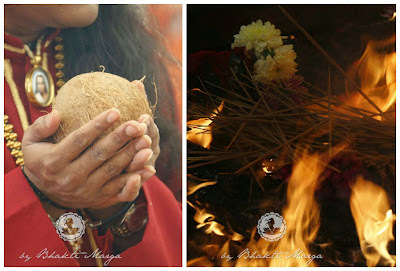 At the end of the Yagna everybody had the opportunity to offer a coconut into the fire. 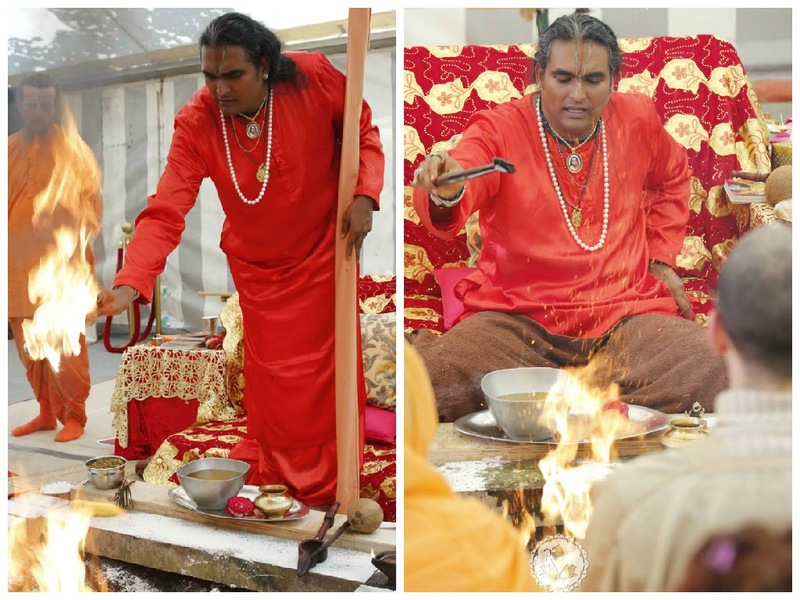 The coconut symbolises the ego and, as Sri Swami Vishwananda once again reminded us, the fire represents the mouth of Narayana. 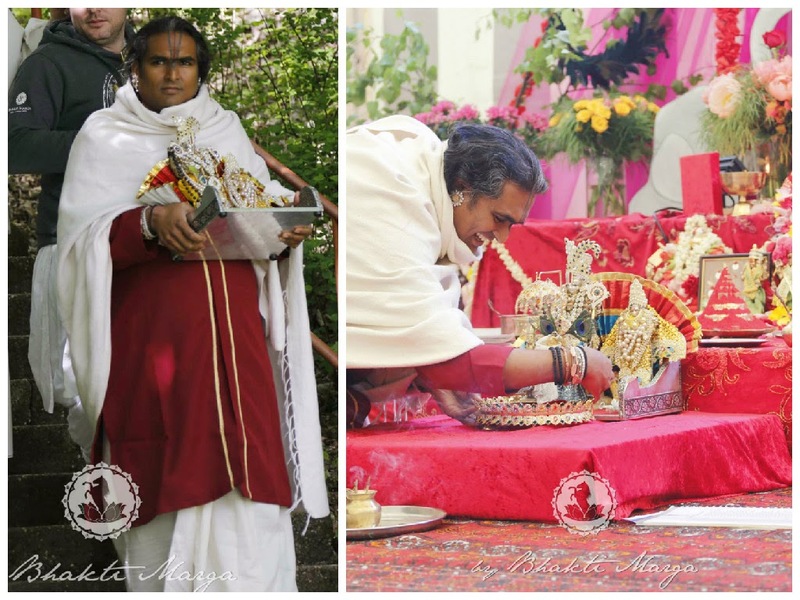 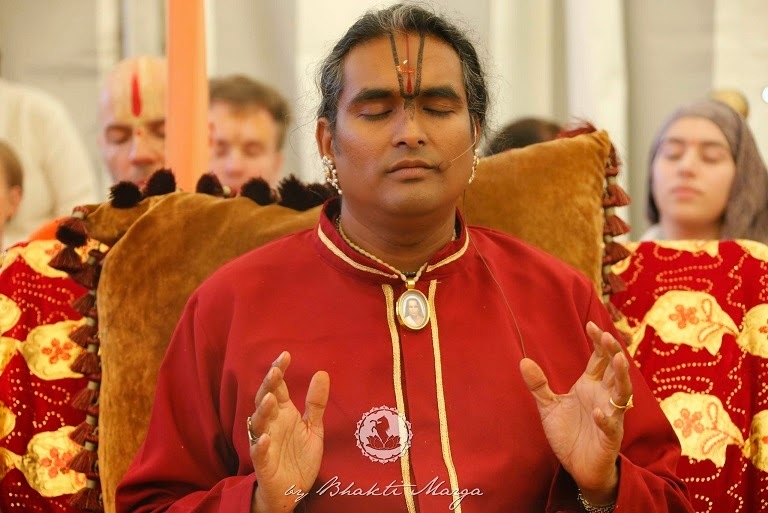 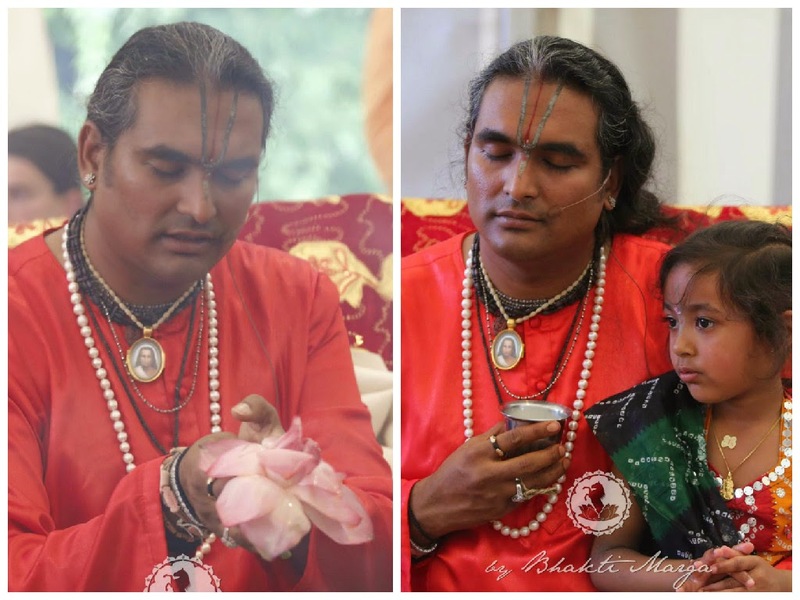 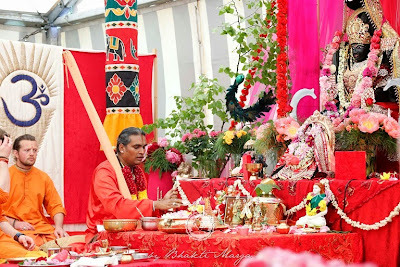 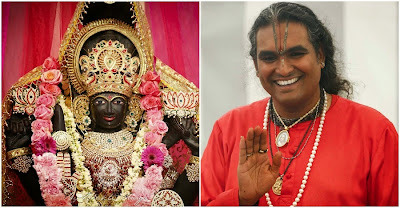 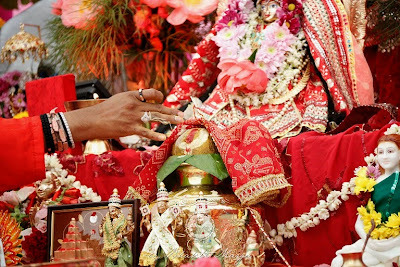 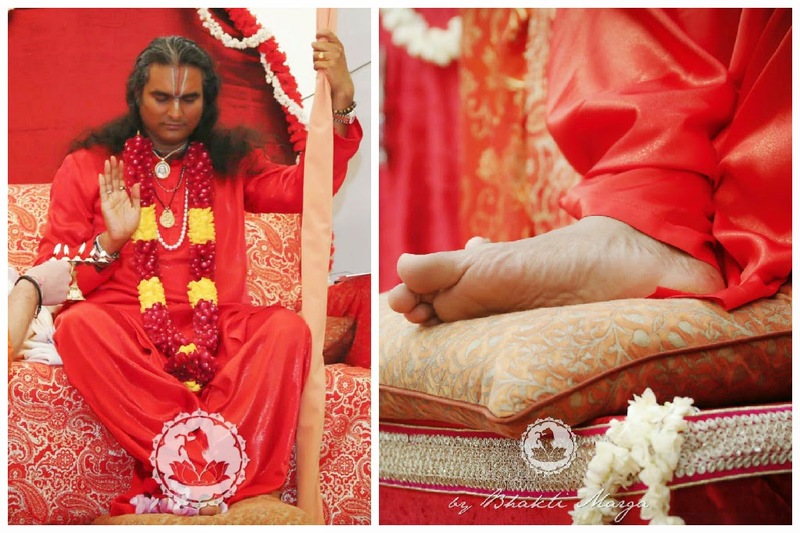 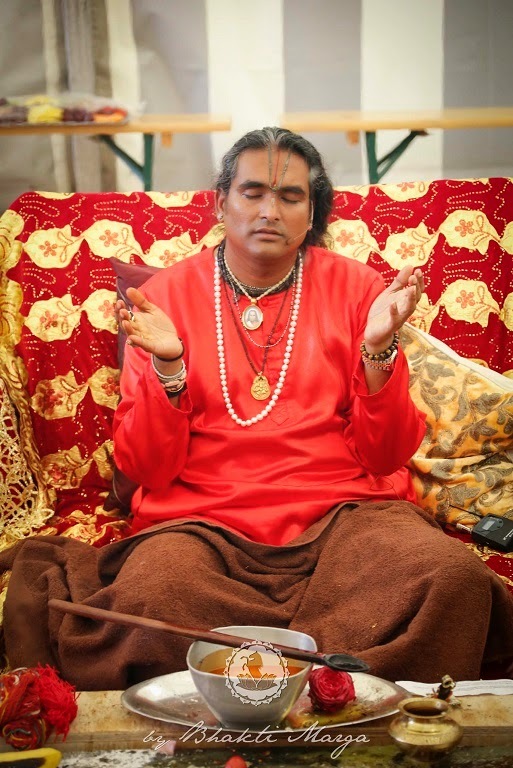 After the Yagna Sri Swami Vishwananda performed abishekam on several of his private murtis, and on one of the main murtis of Shree Peetha Nilaya Temple, named Shree Dhanaa Karshana Shree Mahalakshmi Sahita Shree Kuberaya. At the end of the abishekam Swamiji adorned this particular murti representative of Mahalakshmi with jewellery and afterwards poured the Kalash water over her and over all the other murtis placed on the abishekam tray. After arati, people could approach the altar to receive Darshan of Mahalakshmi. 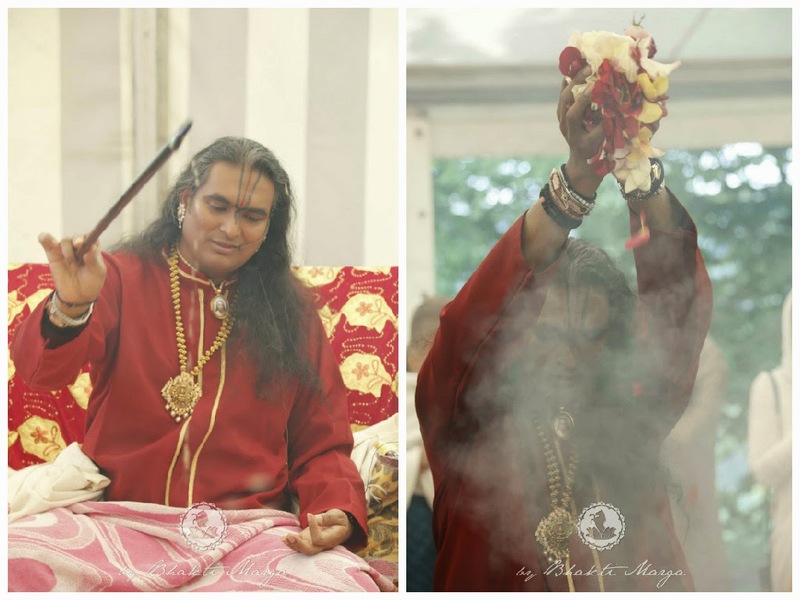 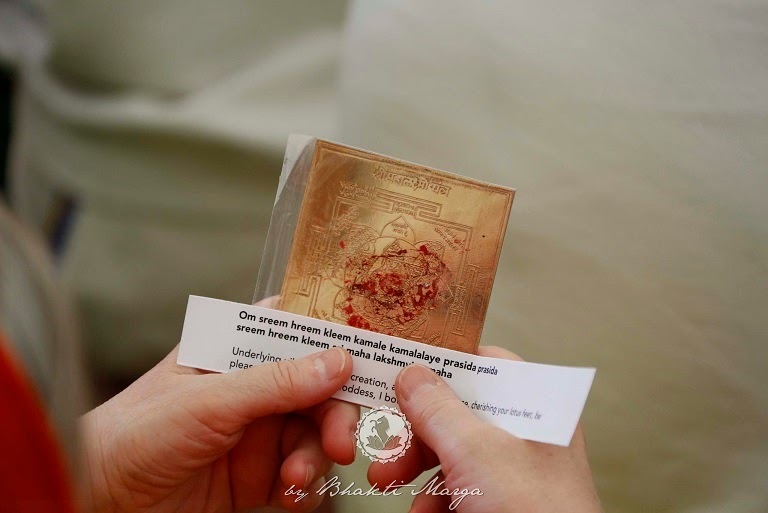 Everybody was also given the opportunity to give Guru dakshina and to receive a piece of laddoo from the hands of Sri Swami Vishwananda. 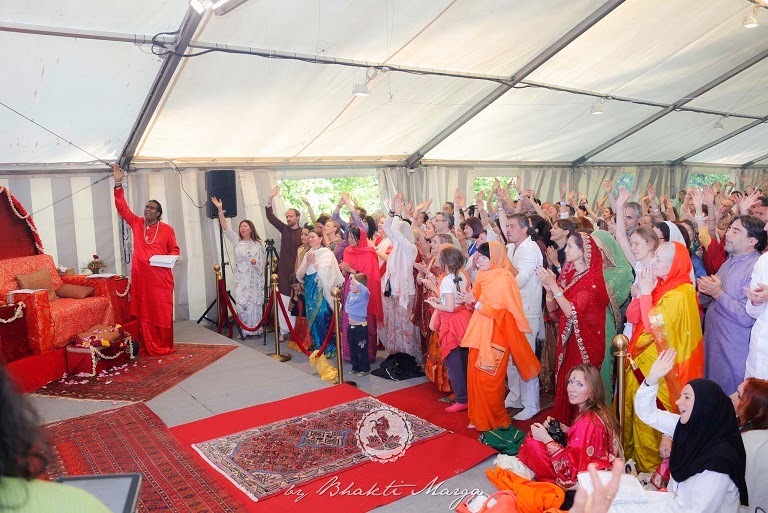 Before closing this two days' event, Swamiji led all the participants in a meditation to send positive energy to Mother Earth.